"I'll take what's in the box, Monty." "It's a death metal band!" The cube is a public art instillation called "Box Sized Die"
(CNN) -- The other day I saw a death metal band hanging out by their tour van in the parking lot behind a club. They were all dressed in black, and may or may not have been working on lyrics to a new song about fire and lamb meat. "What rhymes with 'charred remains?'" Now, I can't say for certain that they were actually death metal. But that's what I'm going with. Admittedly, I'm not very up to date on the various sub-genres of growling into a microphone. Thus, when I don't know any better, I find it's always best to make assumptions. For instance, this morning I assumed I wore pants to work. The people in line at Starbucks assumed differently. "They'd be so much happier if they just wore a little color." Which is a completely insane thing to think. They were probably loads of happy. And they seemed perfectly reasonable. In fact, maybe they were discussing how, if they pooled all their collective happiness and reason, they could open up a combination orphanage and puppy day care center called Unicorn Land. Shame on me for judging. Just because they wear all black and their music probably sounds like a horse choking on a watermelon doesn't mean they're angry people who eat children and worship Satan. Besides, that's so Simon and Garfunkel. The point is, they have their thing. And I have mine. And just because I don't understand or particularly enjoy death metal, doesn't mean it's not good music and, dare I say ... art. Bringing death metal to London's streets. 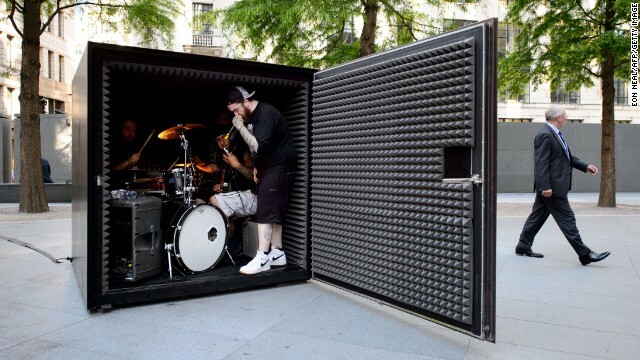 Because art is exactly what was being celebrated recently in London when a local death metal band called Unfathomable Ruination decided to lock themselves in an airtight, soundproof cube and play until they ran out of oxygen. The plan is to do it three nights a week, Wednesday through Friday, at 6 p.m. throughout the month of July. Or at least until they all forget the safe word and suffocate. "I ... should've ... gone ... to law school." The actual cube was designed by a Portuguese artist named João Onofre, and he calls it "Box Sized Die." The Gherken looks like a giant suppository. Symbolism at its finest. Interestingly, the death metal art cube sits right outside the famous London office building known as "The Gherken." 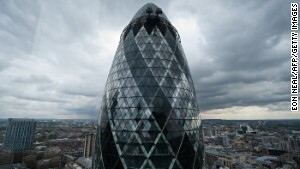 That's the one that looks like a giant suppository in the heart of the Insurance District. 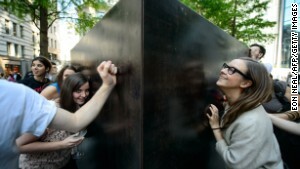 And the cube is supposed to represent the cold, dark working spaces within the surrounding office buildings. Onofre says, "In this corporate architecture you don't really see what's going on inside. The same happens here in the work. 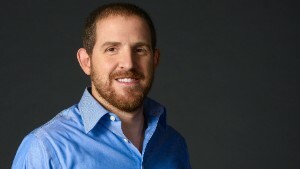 You see it but, then again, you don't see it when the performance starts." Look, I only barely get this. I now have five functioning brain cells, and I'm not prepared to burn four of them trying to digest all the deep meaning from a weird public art display. So, I trust that whatever Onofre says makes sense. I'm more interested in the music. Or, I suppose, the lack thereof. Being that the box is airtight and soundproof, all the music is completely inaudible to the public. They can only feel it. Which is actually kind of cool. Presumably, though, inside the box it sounds like your grandfather passing a kidney stone the size of a Chicken McNugget. Ben Wright, the band's lead vocalist, explained, "We did 14 minutes the first time on the run through. And then we did 19 minutes today." So, it's kind of like musical CrossFit, except this box is actually ... a box. And you don't have to tell your Facebook friends about the sand bag you just lifted over your head. But, hopefully, as the month carries on, Unfathomable Ruination will keep playing for longer and longer. This, despite the fact that it doesn't look very pleasurable. Really, they'd be so much happier if they just wore a little color.